I got this bicycle a few years ago from a good friend, after she didn’t want to drive it anymore. 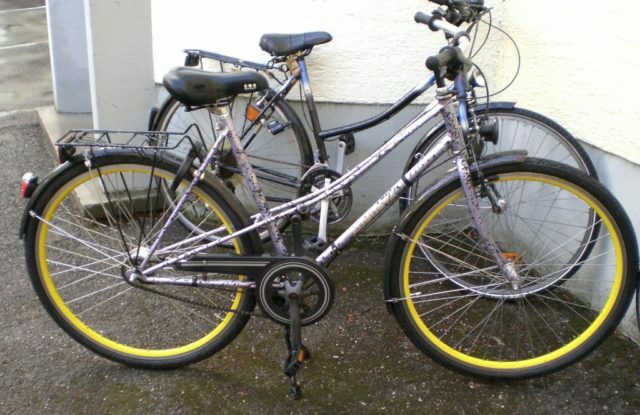 It is an older piece branded “Augusta” with a “mixte” steel frame, 7-gear-hub with back pedal brake (Shimano SG-7C20) and cantilever brake in front. It was kept in the basement, disassembled into single pieces for a couple years and broken wheels and was rebuilt again for a housemate. The result is a bicycle, which is not very light, but due to the wider tires and the 7-speed-hub still drives very good. The low adjustment of the saddle is not a mistake – the user is just not very tall. A click on the following picture opens a larger view.